A long weekend. A rickety sleeper bus ride. Two friends, two strangers and one husband. Ingredients for my Hampi trip had been perfectly laid. I would lie if I said I loved everything about Hampi. In fact to be honest, the first day itself proved to be a daunting task to complete. What with scorching heat, touristy crowd and an ill-chosen short dress completely drawing attention of the public around, I agree that I may have disappointed myself and mentally scrapped the trip’s next few days in head and heart. But it wasn’t meant to be. New dhotis were bought off the local market (as only shorts and dresses had been packed from home!) and a loose over sized T-shirt from husband stolen borrowed. Of course all this with a dash of hope and renewed sense of humour. 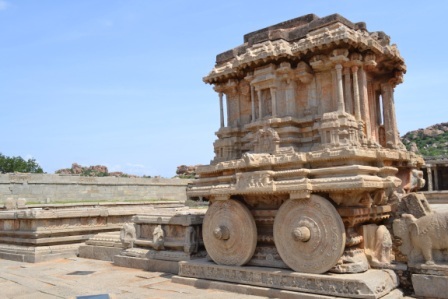 Untouched by modern advancements, Hampi is definitely a travelers delight. Be it its ghetto style colonies filled with people seeking the hippie backpackers’ life or its quaint neighbourhood of Aengudi attracting thousands to the lush green sides. 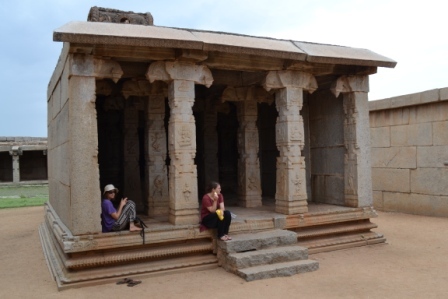 It was said that long long ago after the invasion of the Deccan Muslim Confederacy, the city of Hampi lay in ruins. Only after many years when Robert Sewell wrote his famous book A Forgotten Emplire Vijayanagar that many facts about the civilization came to light. 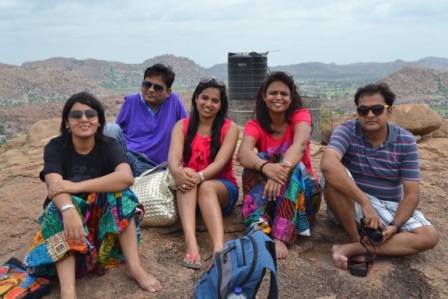 And reading though passages of history, a guide named Santosh re-created the magic of Hampi for us. And woven through those stories of past, among passages of Ramayana and tales of Bali-Sugreev, we found love. Love that Hampi created permeating through layers of crowds and watchful eyes on my bare legs, an-all baring sun and rising temperatures. Sometimes a place borrows its beauty from those that live there and some times its the other way around, but one thing is assured, good company makes all places delightful. Had a great time with you and Vikas! We too had a lovely time 😀 We should do this often! A road trip must have been more fun! Looks like a beautiful place! And I love Jeanette Oke – great quote! 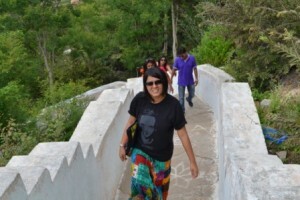 I feel that, as you write so beautifully about Hampi, a post about Ireland would rock! Yes, that kind of love gradually seeps inside you and fills you with all the warmth and happiness! Wonderful post, Richa!